Winter is the time gardeners plan. Sitting inside, looking out a window onto a cold, wintery garden does something to bring out ideas and dreams. We might clearly all the things that need doing, and if looking out that window you see that your garden needs some screening, read on . . . It might seem obvious why you put in screening plants – because you have something to hide, right? In reality, it could be you don’t even realize that what is missing in your garden is screening. We often get used to the way things are, and don’t consciously see what it is that we are finding unsettling. Even if you are fairly comfortable with what you see from your garden, don’t underestimate the impact of enclosing the space, and creating a solid green backdrop to your garden. It creates intimacy, and all your plants look better and more significant against a wall, rather than against the background of neighboring houses, passing cars, or even simply the sky. If you don’t think so, imagine for a moment your living room furniture sitting in a field. What do you think? Does it look better or worse? I think you get the point. Screening gives you that calm, green background, and the feeling of privacy and isolation is very calming on the spirit too. You will be less inhibited and more relaxed. In practical terms too, screening can block noise – from cars, neighbors, sports – and so make a more relaxed atmosphere too. It will reduce wind and make your garden warmer for both you and your plants too. A good hedge or windbreak will raise the environment inside often by half a zone (from 6 to 5b for example), allowing you to experiment with a range of borderline plants. By reducing the wind speed you increase the ‘real feel’ of the temperature, making it warmer for humans too, extending the time you can comfortable use your outdoor space. In winter the slower wind will release snow further from your home, reducing drifting, and snow blowing through a hedge will be trapped, instead of building up inside, or against your home. Once you decide to put in that screen, the next step is to look at the area you want to plant it along. How much space is there available? If this is along a property line, remember that you need to plant you hedge along a line that is at least 3 feet inside that line for a smaller hedge, and 6 feet inside for a larger hedge or unclipped screen. Then there is the thickness of the screen itself, which can grow to be 12 feet wide if you use larger trees. Often how much space you have available will decide what plants you use, and if you trim or leave it au naturel. 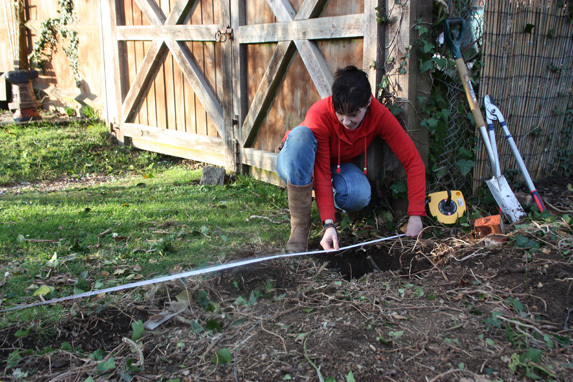 While you are outside checking this with your tape, take the opportunity to measure the length too, so that you can calculate the number of plants you need. This will depend on which plants you choose, but to calculate that number, divide the distance by the number of plants, and then add one more. No, not for good luck, but because the first and last plants will be placed at half the distance from the edges as the distance the plants are apart. For example, if you need to space your trees 6 feet apart, the first and last ones will be 3 feet from whatever it is that makes the end – your front property line for example, or your garage or house. Now you can think about what type of plants you want to use. In most cases something evergreen makes sense, since it gives you screening 365 days of the year. But sometimes a deciduous tree is a better choice, if, for example, the screen is close to windows on its north side. The winter sun is low in the sky, and an evergreen hedge can make rooms dark when it casts a long shadow. The main factors in deciding which evergreen will be the height you want, and where you live. For smaller hedges, and for all hedges in colder regions, the Emerald Green Arborvitae is a top choice. Hardy in zone 3, this dense selection of the native white cedar is perfect for hedges up to 6 or 8 feet, and it can easily be kept narrow too, an important consideration in a smaller garden. If you garden in zone 5 or warmer, the traditional choice would have been Leyland Cypress, but that has largely been replaced with Thuja Green Giant, which is very fast growing, but not quite as big. This tough and reliable hybrid evergreen will give you a solid screen, and it is drought, salt drift, and deer resistant too. For most gardens it is the ‘go to’ plant for screens and hedges. If you live in a very hot and very dry region, like Arizona or California, then consider using Italian Cypress, which is super drought-resistant, and has beautiful dark foliage that looks good under a hot, blue sky. Now it’s time to figure out how many plants you need for that screen. If you have limited space, you will certainly go for a single row. With larger evergreens like Thuja Green Giant, a spacing of 3 feet is the absolute minimum, and 4 or 5 feet is better, if you have a little more patience. This allows the plants to develop more at the base and keeps your planting thick right to the ground. For smaller evergreens, that 3 foot spacing is just about perfect. Anything less than 2 feet will mean the base is always thin, with a tendency to die out. If you have more room and opt for a double row, you end up with the densest screen. Space the rows 2 or 3 feet apart, and stagger the plants in each row, allowing 5 to 8 feet apart for the plants in each row. Again, use the smaller spacing for smaller evergreens or for a quicker fill with something larger, like Thuja Green Giant. Now you are ready to order, and all that remains is to plan on preparing the site. Depending on where you live, you might be able to do this during the winter months, or wait until the ground thaws in spring. Either way, plan on rototilling a strip at least 3 feet wide for a single hedge (obviously wider for a double one) and incorporating a good quantity of rich organic material into the ground. Get the biggest tiller you can handle, and then work it as deep as possible into the ground. Bring in enough compost to dig in a 3 or 4-inch layer, and still have enough left over to mulch about 2 inches deep after planting. That’s it. Once you have your plants ordered for a date after you will have the ground prepared, you are all set to put in the perfect screen, and reap all the benefits of privacy, warmth and silence. Enjoy! The New Year is always a time for new beginnings, and especially for resolutions to do better in the coming year, wherever we think our lives need improvement. Gardeners too are always looking to improve things, and if you take a look at your hedge and think, “Hmm, not so great!”, then maybe this season of the New Year is a good time to make some resolutions to do better by your hedges in the coming year. Here are some ideas for things you can do to have better hedges around your garden, and to help you make a set of New Year’s Resolutions you can easily keep. Let’s start with the worst-case situation – your hedge doesn’t work because the plants are the right choice for your needs. Maybe the prospect of starting again scares you, but don’t worry, you can replace a hedge in a few years, and never regret it. For example, maybe you have a hedge of a deciduous tree – willow perhaps, or some other fast-growing tree. The trouble with a deciduous hedge is that it is, well, deciduous. In winter you can see right through it, and you don’t like what you see. 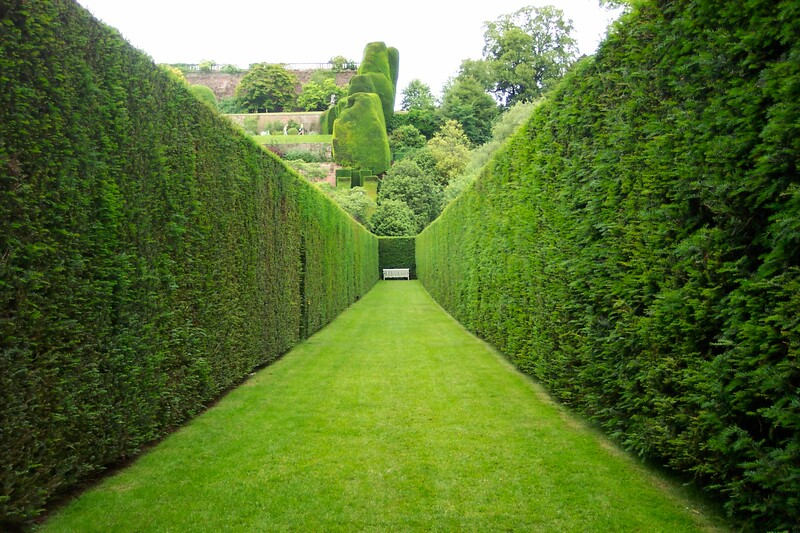 Plus, of course, people can see right through too, and you miss the privacy of a green, leafy hedge. As well, many fast-growing deciduous plants need a lot of trimming, and they always look messy and tend to develop big trunks with all the leaves at the top. Alternatively, you might have a broad-leaf evergreen, like laurel, and are tired of looking at brown edges on those big leaves after trimming. Maybe your hedge is in shade, or in a hot, dry area, and the plants are not well-adapted to their location, so your hedge is thin and wispy, or brown and burned looking. Perhaps in spring a lot of it is burned and brown, from the winter cold, because it just isn’t hardy enough for your location. It could be that you have a very old hedge, and it is thin at the bottom, or bulges out and blocks paths and driveways. There are lots of reasons why you don’t like the hedge you have, but you don’t have to keep it. Whatever the reason, if your hedge offends you, pluck it out. Really. You will be surprised how easy it is to remove a hedge, especially if you bring in a contractor, or use a truck to pull the trees out by the roots. A quick session with a chain saw, into the dumpster, and it’s done. A load of compost, then run a roto-tiller over it once or twice, and it’s ready to replant. Once you remove an old hedge you will be amazed at how much room you get back. Hedges can grow wide without realizing it, and lots of valuable garden space will suddenly be yours. A bigger lawn, or room for garden beds – that space is yours to enjoy. Now you can re-think a more suitable plant for the spot. Luckily, for most areas and most locations, there is one available – Thuja Green Giant. It’s evergreen, so all-year-round screening is easy. It grows across most of the country, and it’s tolerant of some shade, as well as sun, so it will grow well in many parts of your garden. It grows well in most soil, except for areas that are constantly wet, so that is probably not a limitation for you either. Best of all, this is the proven fastest-growing evergreen available, so you won’t have long to wait at all until your new hedge is looking great and doing the job for you. Of course, in the far north you will need something hardier – maybe Emerald Green Arborvitae. In really hot, dry areas a tough juniper, or Italian Cypress are often better choices, but across most of the country, nothing beats Thuja Green Giant. If putting in a new hedge is more than you need, maybe the reason your hedge isn’t doing well could be down to feeding it properly. Hedges are like lawns, that is, plants you trim a lot need extra nutrients, and they can become weak and wispy without it. If you have a new hedge too, then a regular feeding schedule will get it growing at maximum speed and keep it healthy and dense too. Using fertilizer is especially important if you garden on sandy soil, where there are few nutrients available. You can take too approaches – improve your soil by adding organic material that will release nutrients, or you can add the nutrients directly from fertilizers. The ideal thing is often to do both. Obviously when you are planting a new hedge is the right time to add organic material mixed right into the soil, but even an established hedge will respond amazingly to mulching on the soil, without any digging in needed. It doesn’t matter a lot what you use – garden compost, rotted animal manure, city compost or mushroom compost (if these are available in your area), or any other similar kind of material available locally. All these materials improve your soil, retaining moisture and simultaneously improving drainage, and most importantly, slowly releasing lots of nutrients as they rot down. You will soon see your hedge greening up and sprouting strong new growth. Add more each spring for a few years and that tired old hedge will be looking brand-new again. For maximum growth, combined this with fertilizer. You can find out more detail about fertilizing hedges here, but the secret is to add plenty of nitrogen, spread out over spring and early summer, with a boost of potash in early fall to strengthen your hedge for the winter. Modern slow-release fertilizers are available today that only need one spring application to feed all season long, which is a great time-saver. You can use chemical or organic sources, as you choose, they all work well. For the small cost and time needed, regular fertilizer is the most effective way to have a better hedge. Good trimming will prolong the useful life of a hedge, and keep it looking its best. Start trimming while a new hedge is first growing and do it as often as you can. If you wait until it reaches full size before starting, you will never have a dense hedge that stands up to bad weather. Young hedges especially benefit from three or more trims a year, and light trims take just a short time, so you don’t spend so much extra time in the end. The best hedge is the one with dense growth, and many small branches, and regularly trimming is the best way to achieve that. Slope a hedge inwards slightly, while keeping it flat. This lets more light down to the lower parts, so they stay green and healthy right to the ground. A hedge that bulges outwards as it goes up is much more prone to breakage, and to becoming a nuisance. 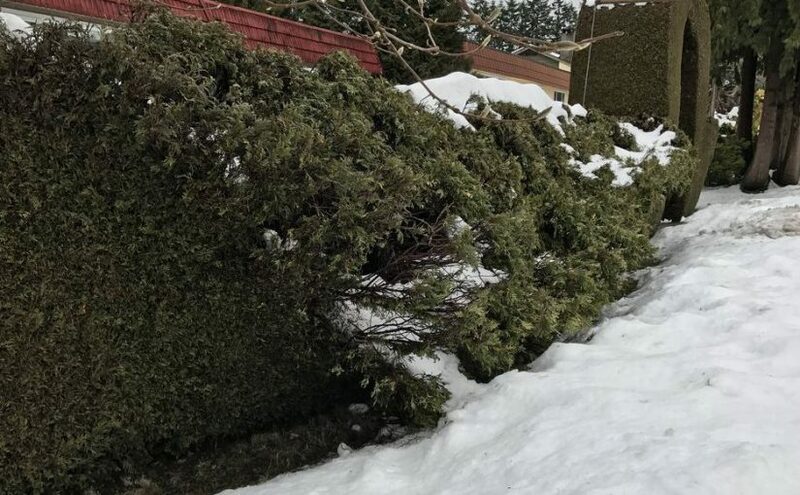 Round the top to prevent snow and ice building up, and of course always use a good hedge trimmer that is correctly sharpened and adjusted – during winter is a good time to drop it in for repairs and sharpening, so it’s ready to go in spring. In life we want the best, right? The same is true in our gardens. Why fill your garden with second-rate plants, that will grow slowly, be weak and unhealthy, and never have the impact and beauty you dream of? Shade trees, flowering shrubs or evergreens – we should always choose the best types and varieties for the purpose we have in mind, and of course for our location. When it comes to larger specimen, screening or hedging evergreens, one variety stands out above the other offerings, for most of the country – Thuja Green Giant. Thuja Green Giant grows well in a wide range of soils too. This plant handles acidic or alkaline soils well, and most soil types too, from sandy soils to clays. It does need moderate drainage, and won’t thrive in soil that is constantly wet, but apart from that it really doesn’t mind. Whatever your soil type, it is recommended to add plenty of rich organic material when you plant. This will retain water in sandy soils, and improve drainage in clay ones, as well as providing lots of valuable nutrients. An annual or bi-annual top-dressing over the roots of similar materials will keep your plants thriving over the long haul too. Some plants need full sun all day long, while others burn quickly when exposed to the hot afternoon sun of summer. Most evergreens like sunshine, and Thuja Green Giant does too. But compared to any similar plant, it is more tolerant of variations in light levels. Of course it will perform best in full sun, growing dense and fast. In real life, however, almost every garden has some shade, at least for part of the day, so along the length of a hedge there will usually be areas that receive more sun, or less sun, through the day. Shade levels also vary with the seasons, with more shade in summer and fall on bigger areas of your garden. Because of its vigor, Thuja Green Giant will perform remarkable uniformly in those conditions, so that you won’t have a screen or hedge that is thick in some areas, and thin and weak in others. In deep continuous shade there are plants that will do better – like Yew or Laurel, for example. But in lighter shade you will still get great growth, and a good density of foliage too. For screens and hedges, we mostly want them yesterday. The quicker than become big enough to do their job, the better. Thuja Green Giant has proven the fastest-growing evergreen in controlled research, and you can be almost certain that in the early years you will see your plants add 3 feet in height every year. They won’t take long to reach your target height, and they will thicken quickly too, giving you the density you need for solid screening – even without clipping. As large specimens too, they grow upright and dense completely naturally, and just look great. That doesn’t mean you can’t clip them – you can of course – and they respond well too, turning into a solid wall, or a tight formal specimen you will really love. Nobody wants to be out spraying their plants, especially in this time of concern over chemical exposure. You certainly won’t need to be spraying if you choose Thuja Green Giant for your garden, because it is right up there for resistance to diseases and pests. With its natural toughness it will soon recover from anything that does come along, so you can plant with confidence, knowing that this is one plant that can take care of itself. Many people have horror stories to tell about their battles with deer, which can ravage a garden overnight. Deer are hard to predict, and if hungry enough, just like people they will eat just about anything. So no, we won’t say that no deer, anywhere, anytime, has ever taken a bite from a plant of Thuja Green Giant, but we will say that it rarely happens, they rarely take much, and the plants almost always recover rapidly. Compared to most other evergreens, and certainly others with soft-foliage like Thuja Green Giant, this plant is certainly deer resistant. Some evergreens look lush and green in spring and early summer, but then they can yellow in the hottest months, or turn brown in winter, especially when grown in cold areas. Thuja Green Giant is not like that. It stays green all year round, and indeed, it often looks at its best in winter, when the softer light brings out the green in most plants. Other kinds of Thuja plants are very prone to turn bronzy and brown in winter, not recovering until the new growth appears in spring. We really don’t want our plants to do that, since that green in winter is so much more cheerful, and Thuja Green Giant won’t. It is always green. So you probably get the idea by now. If you are looking for large evergreens, to create a screen or hedge, or to plant as low-maintenance specimens around the garden, then it is truly hard to find a single reason why Thuja Green Giant is not your best pick, while there are many reasons why it is. So make your life simple, and choose the best. 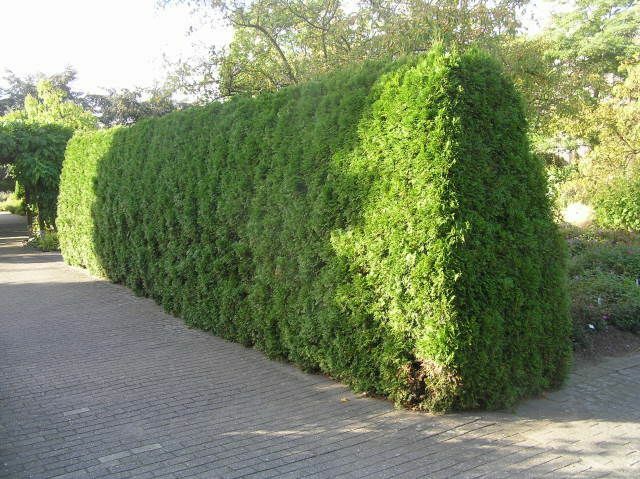 Most of the millions of plants sold of Thuja Green Giant as planted in hedges, but while that is an important use, there are other things you can do with this great evergreen to add useful and attractive features to your garden. Some of the following things might be issues or problems you have, so here are some useful ideas that show just how versatile this plant is. Foundation planting is the plants – both evergreen and deciduous – that you place close to and around your home. The overall purpose is to visually tie the house to your lot – so it flows into the surrounding garden, rather than sitting in a blank space. When choosing plants for this purpose we often need smaller plants, that will fit between windows. Often, though, there are places such as the angle between two walls, or blank wall areas two stories tall, where taller plants are needed. Since there are often windows on either side, these plants need to be upright and not too broad. Thuja Green Giant can be the perfect choice for such a spot, especially in a home that is at least two stories tall, or that sits on tall foundations. Because it grows fast, it will soon reach to the second floor, and then the roof, screening all that harsh wall surface, and reaching up from the surrounding plants. Because it stays narrow, even when it rises above the eaves it won’t overhand the roof, and become a potential hazard, the way many trees can, and being evergreen it looks great all year round. If you have a larger property, especially in a rural or semi-rural area, exposure to strong winds and storms can really inhibit what you do in your garden. A solid screen is often not the answer – it can cause wind-tunneling, and itself be damaged in storms. Better is to filter the winds, so they slow down, drop their snow in a storm, and this gives you much better protection. A barrier that is about 50% solid gives the best results, and a windbreak 35 feet tall will effectively protect a zone 500 feet deep – the size of most large lots. A good windbreak has a central core of tall evergreens, flanked on the both sides with smaller deciduous trees and shrubs. A good variety of plants paints a much more attractive picture than a solid screen of one plant, and it also becomes a valuable refuge for birds and wildlife. Thuja Green Giant is the perfect choice for that central spine – because it grows so fast it will soon give valuable protection not only to the garden, but to the other plants in the windbreak. You will be amazed at how much improvement there is in the value of your garden, and the range of plants you can successfully grow, once a windbreak has been in place for a few years. A row of Thuja Green Giant, spaced 12 feet apart, makes the perfect spine for your windbreak, and gets it off to a flying start. If you have a long driveway, nothing gives it more of an air of importance and even grandeur, than flanking it with a row of trees. Imagine a double row of stately green columns along that driveway – a beautiful sight. Thuja Green Giant is a terrific choice for this purpose. Space the plants between 15 and 20 feet apart, depending on how long your driveway is, and keep them in facing pairs, even as you go around the curves, where the outside row of the curve will need to be further apart than the inside one. Be careful to set them well back from the driveway – at least 6 feet, and 10 is better, so that it doesn’t become a narrow tunnel once they grow tall. Keeping them well spread out will increase the sense of space and grandness and give you an entrance of real quality. If trimming hedges is not your thing, Thuja Green Giant is great for more informal, unclipped screens. Maybe you want to hide an ugly view, or you need privacy from surrounding buildings or homes. Since Thuja Green Giant stays neat and upright even with no clipping, it’s the perfect choice for an evergreen screen that does the job 365 days of the year. Since it grows so fast you won’t have to wait long at all for a good outcome. For a screen the best planting is a double row, with the plants in one row facing the spaces in the other – a zigzag arrangement. Allow 5 feet between the two rows, and 8 to 12 feet between the plants in each row, depending on how dense you want to screen to become – it doesn’t have to be solid when you use double rows. On a smaller lawn, a traditional shade tree can become too wide. Thuja Green Giant will always look lush and green all year round, and it makes an attractive alternative. On a larger lawn you can add a few among the trees, so that the area has more visual interest when the leaves have fallen from the trees. If all the plants in your garden are rounded, the eye tends to rush over them, and you don’t notice much. When we meet an upright accent, we stop for a moment, and that helps us take in more of what we see. The result? Your garden is suddenly more visually interesting and satisfying. Accents placed at the end of lines of site, perhaps between parallel beds, brings the eye to a full stop, and effectively completes the scene. In small gardens these accents can be a single plant, and in larger ones, groups of three are very effective. Around your home you can put emphasis on the front door with a pair of evergreens on either side – make sure you space them well out, so that they don’t end up crowding the door space. Nothing creates the ‘room outside’ like a clipped hedge. For taller hedges nothing beats Thuja Green Giant. It gets to the height you want quicker than anything else will, and it clips beautifully into a dense green wall. To mark the boundaries of your property, or to create internal spaces in a larger garden, plant your hedges as the first job, so they are well-established by the time the rest of your planting starts to mature. As you can see, Thuja Green Giant is far more than a hedging plant. Utilize its fast growth in lots of ways around your garden – for speed, toughness, all-year-green and trouble-free growth, it simply can’t be beaten.